Welcome to Designer Glasses Boutique we hope we can help you to find your perfect glasses. Here at Designer Glasses Boutique we’re here to help, if you have any questions or even just want to have a chat feel free to give us a call or email us and we’ll get back to you as soon as possible. We’ve also created a buying guide, don’t worry we don’t expect you to read it all! It does give you information on lenses and glasses, but don’t worry there will be no test at the end. So lets start with your prescription, probably the most technical bit. Here’s the professional bit....what does it all mean? You will have two rows one for your right eye and the other for your left eye. All prescriptions with have a Sphere (SPH), this will begin with a plus (+) or a minus (-). A plus is for people who are long sighted, this means that you find it difficult to see objects close to you and a minus is for people who are short sighted, and this means that you find it difficult to see objects far away. The majority of prescriptions have a plus or minus in both eyes, although it is possible to have one eye with a plus and the other with a minus. Please ensure that you put the correct plus or minus when you are placing your order, at Designer Glasses Boutique we do check all our orders to ensure no common mistakes have been made, however if you do enter the incorrect prescription we will not be able to refund you for the lenses, as per our terms and conditions. However, if you are unsure please give us a call and we can help you! You can always email us a copy of your prescription and we can enter all the details for you. The Cylinder (CYL) and Axis are not present in every prescription, they measure astigmatism in the eye, not everybody has this. If you Optician have written DS or SPH in these boxes, this means you do not have astigmatism, so you can leave this blank. Astigmatism is visual distortion and it is caused by an irregularly shaped cornea. The ADD power is required for glasses for reading, so this is needed in reading lenses, bi-focal and varifocal lenses. If you have a prism on your prescription please give us a call or email and we will be able to advise you. If you’re not sure then we are on hand to help and our friendly Optician can check any questions that you may have. Alternatively you can always email, or fax (yes we still use our fax machine!). What is my pupillary distance? You may be wondering to yourself what is a pupillary distance (PD), well quite simply it’s the distance between your eyes, measured using the centre of your pupils. So it helps you to get the optimum level of performance from your lenses. There are a few ways, you can ask your Optician, although sometimes they may not give it to you, you can send us an old pair of glasses and we can get the measurement for you, you can measure your PD yourself, all you need is a friend and a ruler (ask us for our guide). Alternatively we can take the average measurement of 63mm. So let’s move on to different lens indexes, this is what will alter the thickness of your lenses. The lens thickness will depend on the glasses/frame that you have selected and your prescription. Now if you’re thinking about coatings and tints don’t worry I’ll get on to that. 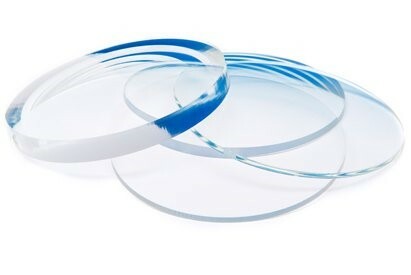 Standard lenses come in a range of thickness. If you have a prescription that is between 0.00-2.00 and are choosing a full rimmed metal or plastic frame then the standard 1.5 lenses will be fine for you. If your glasses are rimless or semi-rimless (this is when the frame doesn’t completely go around the lens) and your prescription is between 0.00-2.00 then we would recommend a 1.59 or a 1.6 index lens because lenses in rimless or semi-rimless frames are more prone to cracks, chips and breakages due to the lens not being fully supported all of the way around. 1.59 & 1.6 lenses are made from a more dense plastic material so won't chip or crack if knocked or dropped. Now you’re thinking well my prescription is over 2.00, which lens shall I pick? Well the next option is 1.6 index lens which reduces thickness by 30%, compared to a standard lens, we would recommend prescriptions between 2.25 and 3.50. As I said previously we also recommend a 1.6 index lens for semi rimless and rimless frames. A 1.67 index lens reduces thickness by around 40% and we would recommend for this index for a prescription around 3.50 and 4.50. A 1.74 index lens is recommend for any prescription over 4.50. The 1.74 index is the thinnest plastic lens material available. A 1.59 is another option, this is a polycarbonate lens, it’s just about as thin as a 1.6 index lens, it’s a very lightweight lens and is impact resistant so is particularly good for sports players or people who really appreciate lightweight glasses. We are also able to offer the option of glass lenses, as standard all our lens are plastic however if you would prefer glass lenses please contact us with your prescription details and we will be able to offer you some options. Now that you have decided the lens thickness the next step it to think about the coatings that you would like on your glasses. As the name suggests this coating helps to prevent scratches to your new lenses, it acts as a protective layer thus making the lens more durable. Scratch resistant coating helps to prolong your lens life. 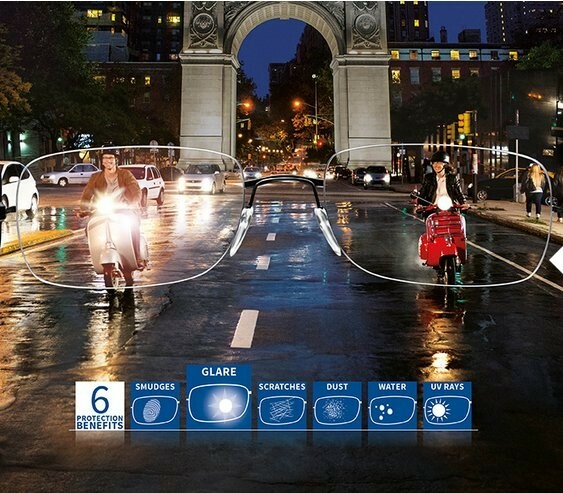 The anti-reflection coating reduces the reflection on the front surface of the lens and reduces glare from bright objects, this is especially useful to reduce glare from phones, tablets, computer screens, artificial lighting and when you are driving as the glare from oncoming headlights will be reduced. 100% of UVA and UVB light is reflected, ensuring your eyes are protected. Crizal Sapphire UV maintains industry leading anti-reflective, scratch resistant, smudge repellent, water repellent and dust repellent benefits ensuring ultimate lens protection. Everyone wants to be seen in their best light. Crizal Sapphire UV sets a new standard for lens transparency. Meaning wearer's selfies are not interrupted by unwanted lens reflection. The above photograph illustrates the difference with and without the Crizal Sapphire UV anti-glare lens treatment. The Crizal Prevencia coating is the very latest from Essilor, the Crizal Prevencia coating is the first clear lens to prevent long-term damages for your eyes by selectively filtering harmful UV and blue lights. UV light from the sun can cause cataracts while blue-violet light is one of the contributing factors of damage to retinal cells. Prevencia also lets in the good light that regulates sleep and mood, and boosts brain activity. By choosing Crizal Prevencia, you are protecting your eyes on a daily basis and maintaining your long-term eye health. It has all the same benefits as the Crizal Forte UV coating plus it blocks out the bad light and lets good light in. The Crizal Prevencia lenses have a 2 year guarantee which covers scratching, in the event that your lenses are scratched Essilor will replace the lenses without quibble. The Crizal Sun UV coating is available with prescription sun lenses, the Crizal Sun offers additional UV protection, the Crizal Sun reflects 4 times less UV light from the back surface than standard sun lenses. The coating also has additional glare protection by eliminating the reflection of visible lights the Crizal Sun coating protects your eyes from the discomfort of black surface glare. Another great advantage of selecting the Crizal Sun lenses is that they have less smudging and therefore the lens will stay cleaner longer and are much easier to wipe clean, this is due to the combination of back surface anti reflection coating and super-hydrophobic treatment on both surfaces of the lens. Transition lenses basically change from clear lenses when indoors and dark when outdoors. They are advanced everyday lenses, clear indoors and at night. Up to 40% faster reaction speed than standard photochromic. They also block 100% of harmful UVA & UVB rays, they are available in three colours, brown, grey and graphite green. The transition XTRActive lenses give you extra protection from light, even in the car. These transitions are ideal if you have an active outdoor lifestyle and if you drive frequently. The transitions have a hint of tint that protects eyes from harsh indoor light. The XTRActive lenses are also extra dark in bright sunlight and hotter climates. Suntint are a tint that is added to the lens and is permanently on the lenses. We offer a range of colours and we are have the availability to offer light tints or dark sunglasses tints, giving you a great choice of options. Mirror lenses are one of the latest trends to be seen of sunglasses, the mirror lenses are available in a choice of 4 colours and also have an anti-reflection coating as standard which prevents back reflections. Polarised lenses are ideal if you drive a lot of the time, the polarised lenses reduce glare, which is ideal when driving on wet roads. The polarised lenses are also good for water sports and winter sports as it reduces the sunlight that is reflected onto flat surfaces, for example, snow, ice and water. Another benefit of these lenses is that they block out 100% of harmful UVA and UVB rays.